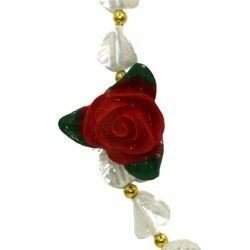 Red Rose Beads are hand strung beads and come in 42" length. 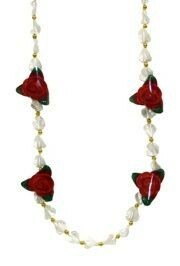 Only customers who&apos;ve bought Red Rose Necklace are allowed to review this product. Well made, as usual. Pretty roses. Have to buy earlier next year. 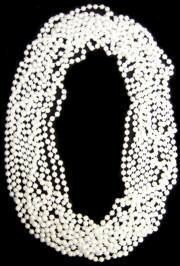 The Magnolia Necklace was sold out by the time I ordered. 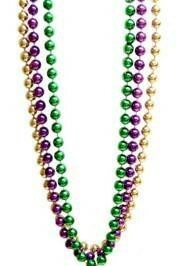 Get your beads here and early. |< << 1 >> >| Displaying 1 to 2 of 2 Reviews. There are four red rose medallions separated with white petals and gold ball spaces. 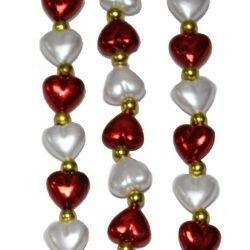 Flower beads are great for Mardi Gras throws, Birthdays and valentines Day. 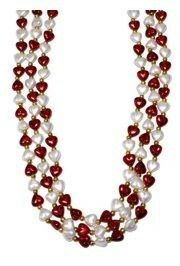 This necklace is perfect as Mardi Gras throw beads or for your sweetheart on Valentine's. 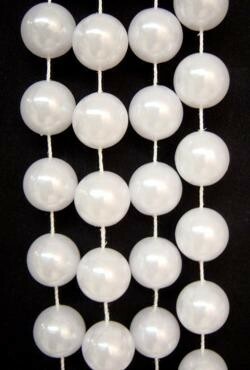 This is a long bead at 48in and it comes in 6 colors. 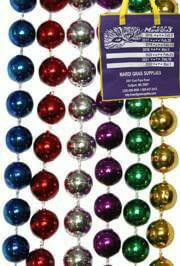 The colors are metallic blue beads, red beads, silver beads, purple beads, green beads, and gold beads. They are sold by 1 dozen (12) bags and 15 dozen (180) cases. 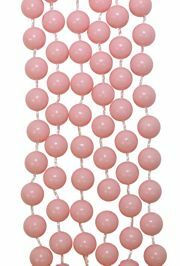 Big beads and long beads are the most sought after throws. 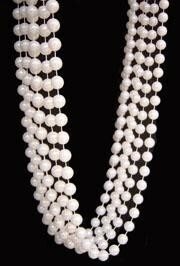 At 60in long and 18mm thick this is definitely a large Mardi Gras bead. 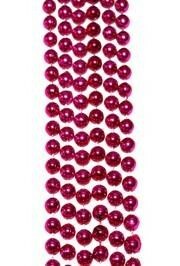 They come in the traditional colors - purple beads, green beads, gold beads. 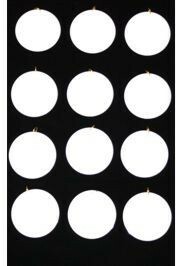 They are sold in 1/2 Dozen (6) bags and 5 Dozen (60) case. 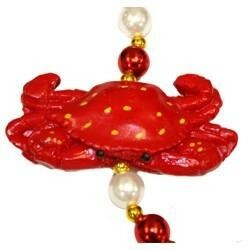 The Red Crab/Seafood necklace is a 42in long hand-strung bead. 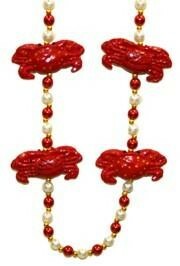 There are 4 red crab medallions with red and white beads and gold spacers. 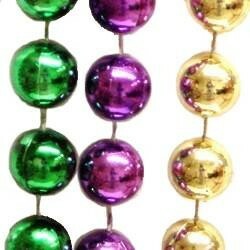 These make great Mardi Gras throws and are listed as Animal Beads, Sea Food Beads, and Cajun Beads. 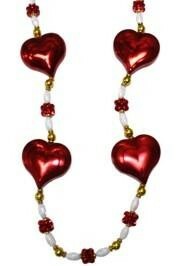 Need a great pair of beads for Christmas or Valentine's Day? 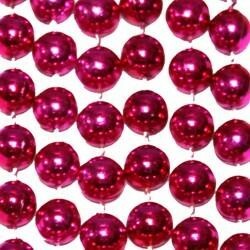 These 33in beads are a metallic Hot Pink and make great special occasion beads as well as Mardi Gras throw beads. 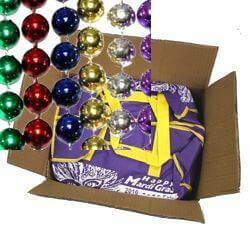 They are sold in 10 Dozen (120) bags and 60 Dozen (720) case.